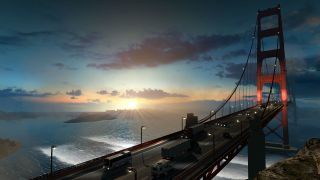 We got a brief look at American Truck Simulator at the PC Gaming Show, but that was a mere teaser. This trailer from Gamescom is a more leisurely look at the game, showing a selection of trucks and some relaxing new landscapes. America seems so much more glamorous than Europe here; it's all sunsets in the desert and night-time cityscapes and the Golden Gate Bridge. That and the soundtrack makes it look like some kind of OTT rom-com where the infatuated truck driver has decided to drive across the whole of the United States to win back his one true love.